Time doesn’t fly when you’re hungry, but it does when you’re in Hungary! It’s been a while since I’ve (publicly) made one of those jokes, so I thought it was about time I do it. Feel free to laugh and tell your friends. The reason I’m thinking about time flying by is that it just hit me that this is the fourth summer I’ve been in Hungary. It takes noteworthy occasions to point this out, and for me, that was the 4th of July (aka Independence Day in the USA). Four. Four summers. Four periods of unrelenting heat with virtually no ice cubes. And that doesn’t even count my initial arrival in August, so really it’s more like five. Most people spend summers in countries with beaches or nice climates. Well, most people aren’t very creative. Anyway, I wanted to talk about July 4th. It’s weird spending your big national day in the borders of another country. The internet allows you to see in real time that your friends are holding flags, sitting at baseball games, and doing other patriotic acts. Yet, the people walking down the street next to you seem completely oblivious. To make it worse, the World Cup is going on. 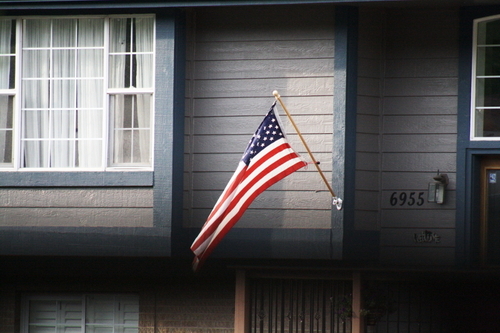 I grew accustomed to seeing American flags waving on this particular day, but this year it was mostly the three horizontal German colors waving around. Maybe it’s a geographical location issue, but out of the four important games yesterday, I’d give the Cup to Germany and second place to Brazil based on fans wearing their support. Maybe the French are boycotting Budapest because of its lack of croissants. And what is Colombia’s excuse? But, soccer wasn’t on my menu yesterday. Actually, my menu seemed to be set with a single option that wasn’t very tasty: my MBA thesis. With the deadline approaching, it seems to trump most other social activities. It’s pretty cool. In order to spare me from my pain, I’ve been able to escape the distractions and heat of the center of the city in favor of a house in a nice quiet neighborhood in the hills. The nights are quiet, the air is clean, the wasps are making nests around me, and it seemed almost perfect for July 4th. But, I forgot my baseball bat, so my options were limited. “So, in America, what do you do to celebrate this day?” I was asked. Notice how she left out the blowing things up and playing baseball? That’s what you get for hanging out with women. They always skip the important stuff. 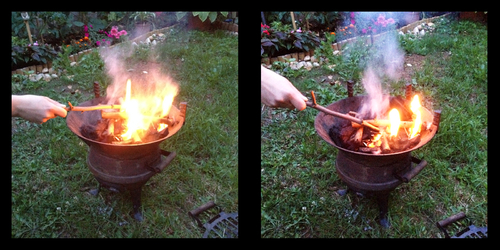 So, we set up a little charcoal grill. After some confusing time spent on opposite sides of a language barrier, I finally got it across that I had no idea how to do it because I always used a propane grill. I was then politely banished from attempting to ruin dinner, and I took the opportunity to get some pictures to capture the moment. The “hot dogs” were good, and the onions were even better. Since proper buns are scarce, we improvised with “kifli” or crescent shaped rolls (that, for some reason, are super popular and can be found everywhere). To add a Hungarian touch, we had to throw on some “szalonna” to give the meal some more taste. Szalonna, in my part of the world, is called “bacon fat.” But the Hungarians love it, and I’ve been told I’ll never understand because it’s not in my blood. 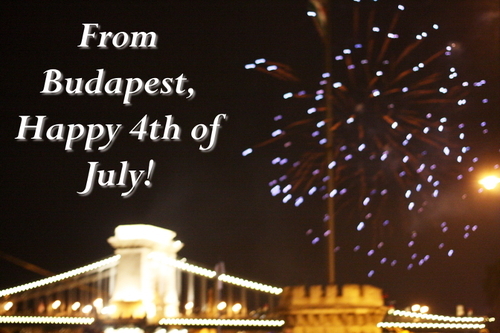 So, Happy 4th of July, everyone! This is pronounced “Veer-sh-lee,” and it’s a kind of sausage food. Wikipedia describes it as Vienna sausage, but I would say it’s the closest thing I can get to hot dogs, but still not quite right. 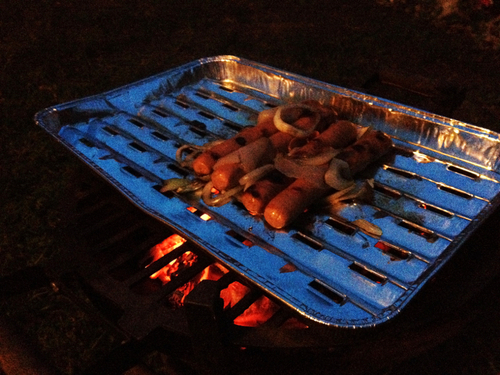 No problem, though, they made for a great (and delicious) grilling experience. DISCLAMER: I’d like to make it perfectly clear that I think Hitler sucked. So, if you’re looking to join a Nazi fan club, I suggest heading back to google and trying your search again. This article has the intention of making fun of that angry little man. So, I recently spent some time around Lake Balaton which is frequently referred to as the “Hungarian seaside.” It seems to have a wide range of things from palaces to tourist traps to wineries, and it all blends together in a strange way. This keeps you on your toes because you’re never sure whether to feel like an aristocrat or a redneck (or, a Nazi, but keep reading for that…). Last weekend, I was bumping around the town of Balatonlelle, and it had that feeling that can only be achieved by a town which people visit until they’re too sunburned to remain. There were a lot of beach town essentials around: restaurants with greasy food, hairy men wearing nothing but a speedo on a public street, and plenty of junk shops. We had a brief period of aimlessness between our morning coffee and our artery clogging langos brunch, so we decided to look for souvenirs and have flashbacks to our childhoods in the trinket stores. Shockingly, the boy in me wanted the bow and arrow while my female companion was much more interested in the elaborate bubble making toys. Anyway, we stopped at one shop where I was drawn in by a cultural lesson on some “very Hungarian” little clay pots that were suggested as souvenirs for my friends and family back home. 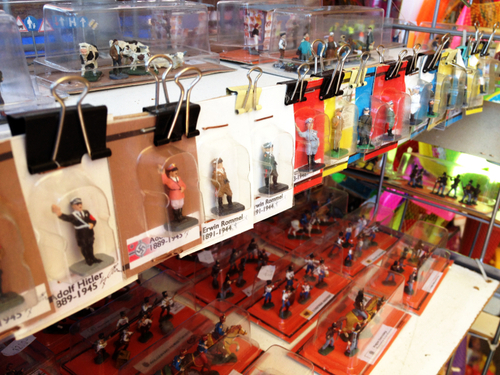 Then we drifted past the matchbox cars, more bubbles, and wandered into the Adolf Hitler section. I’m not joking, you could by your mini Adolf in whichever outfit you preferred, and he even was locked into his famous saluting pose. Next to him, for the man who wants to complete the set, was Rommel and some other members of the Nazi All-Star Team. Charles de Gaulle and other less controversial figures were further down the line, but they obviously weren’t what draw in the customers. So, if you know what these are for, I’d be happy if you shared it. Until then, I’m going to be reading up on beach etiquette out of fear that I’m missing some critical part. This is slightly different because it’s a name – not just a word. But, it’s said to be the biggest lake in Central Europe, and it’s a pretty popular summer spot in Hungary. So, if you need a place to cool off in the summer, or just want to by some mini Nazis, you have found your destination. I haven’t posted anything in a while. I’m, unfortunately, aware of that. Finishing my exams, writing my thesis, and searching for a job seemed more important (even if more boring…). Anyway, I did make it on a cool trip a few weeks ago. I can say with almost 100% certainty that you don’t know anyone else who has stayed where I did. I have some nice pictures and interesting stories, and this is picture is a reminder to myself to share them with you. It’s pronounced “faw,” and it means tree. Rarely are Hungarian words this short and easy. I've seen this building many, many times. How can I see it differently? If you live in the same city for a while, you start to know it too well. You have trouble exploring. After all, how can you find something new when you’ve already found everything? To make it worse, you know the most efficient way to get everywhere, so you rarely have to try a new way or take a wrong turn. I don’t know everything about Budapest. I haven’t been everywhere, and I haven’t seen all there is to see. Plus, even if I had, things change so there’s always something new to find. But, I tend to have to go farther and farther away to find areas that I’m not familiar with. It’s hard to find the motivation to do that when I live and study right in the middle of some really cool neighborhoods. So, in the spirit of my Innovation class (which only has a small amount of homework – you’ll understand this reference if you keep reading), I decided to innovate my exploring. 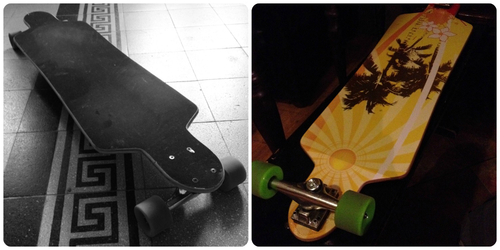 I bought a longboard. Suddenly, I can go farther at much faster speeds. I just explored a big park that I’ve been to a bunch of times, but this time I saw more than ever before. Instead of thinking, “no, that way looks like a long walk to nothing, I’m not going to bother,” I found myself just taking it and finally seeing what was at the other end. Unfortunately, I haven’t had time to explore as much as I would like. The gods of school seem to frown upon fun, and they took this opportunity to send unprecedented lightning bolts of homework. Also, my body is struggling to keep up with the new muscles needed to travel this way. It seems they’re slightly different than the “metro riding muscles.” Shocking. If anyone knows of places with long, smooth sidewalks or roads, let me know! I’ll check them out. 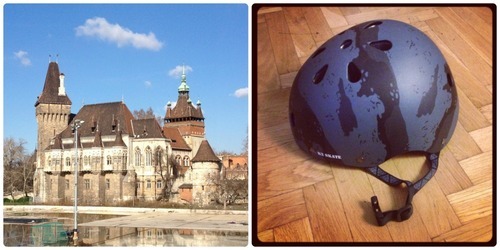 With castles like this around, I decided I needed a helmet to protect my brain! They want to know why I came to this country. The world is a big place, and Hungary isn’t particularly well known. At the moment, it’s not known as being too prosperous or desirable. A large percentage of Hungarians (especially young people) are moving abroad to find more a better quality of life. Therefore, it usually comes as a shock to people that this is where I choose to spend my time. But, I think they’re missing the point entirely. They always want to know what made me come here in the first place. Despite the fact that I often try (but rarely succeed) to convince people I only came here because I got lost, the question actually has a simple and boring answer. I found a job. It’s that straightforward. A lot of people are in Hungary because of marriage. So far, I'm safe from that one! What people should ask is why I have stayed in Hungary. I originally came with an employment contract of one year. When I did that, I assumed I would either like teaching and move to another country to continue exploring, or I wouldn’t like it and would go home. Instead, I moved to the capital city and continued. One more year of that, and then I switched back to studying without moving to a new land. So, that’s a much more exciting question. What do I like about Hungary? What has kept me here? There are a lot of reasons that I like Hungary, so I have a new goal to start writing them, one-by-one. Cool houses, that's one thing I love about Hungary. Reason #1: I feel welcome here. That sounds cheesy. I guess it is cheesy. I don’t care. Hungarians often get a reputation among foreigners as being “mean” or “cold,” but I disagree with that (except if you forget to acknowledge that something was invented by a Magyar). Most people frown when they walk down the street by themselves. They don’t make polite conversation to strangers on a bus. But, that doesn’t mean they’re rude. Well, some are, but you’re always going to have exceptions (they’re probably just mad they didn’t invent something yet). I think there are a lot of different historical reasons (that I won’t go into) of why their culture has adopted that practice, but it’s not very different from many other nearby countries. Plus, Hungarians tend to be very jolly when they’re sitting in a café with friends. They smile while they chat on trains. They even have absurdly polite (and confusing) expressions that are often used in their language. The thing is, I feel like they don’t particularly care for strangers. But, it’s really not difficult to stop being a stranger. I’d like to compare them to dogs (keep reading, before you think this is an insult). I love dogs, and one of the biggest reasons is that a dog treats you very well if you give it a little bit of food and love in return. 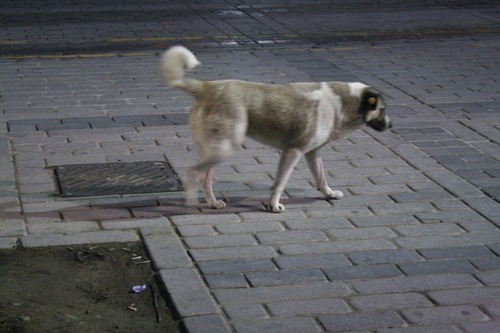 Hungarians tend to be the same (except, they commonly greet people by shaking hands, not the other method which dogs prefer…). I can’t count how many times I’ve met a Hungarian, and they almost immediately insisted on doing some huge favor for me. It’s actually more difficult to get them to leave you alone. “No, it’s okay, I can take care of it myself” is a phrase that seems to have been left out of their English textbooks. It seems that every time I start to feel homesick or out of place, it happens. A Hungarian pushes their way into my life and immediately includes me in something that’s going on with them. I could give you a lot of examples, but mind your own business. Just go make friends with a Hungarian - you’ll see what I mean. So if you feel unwelcome in Hungary, it’s because you’re not actually talking to anyone. That’s your fault, not theirs (but as soon as someone realizes it, they’ll start talking to you). A castle, maybe that's the trick to welcoming people. I was on my way to school, and I was absentmindedly thinking about the person wearing the University of Colorado jacket on the sidewalk in front of me (here’s the logo, if you don’t know it). It didn’t feel strange to see someone representing my alma mater until I realized that it was a world away from me. In hindsight, it probably would’ve been cool to go stop the person and ask if they were actually from Colorado, or if they just got the Buffaloes jacket somewhere. I don’t like when strange people approach me on the street, so I wanted to save her the trouble of a creepy guy bothering her first thing in the morning. So, I snapped a few quick, blurry pictures with my phone and ducked down into the metro station. Fact #1: I love snow. Fact #2: It has been avoiding me this winter. Before I begin, you must know that I’m the guy who often surprises people by saying I love winter more than summer. Many describe it as a dark, cold, depressing time of the year. I think of it as a time to bundle up in clothes and enjoy the cozy feeling of cafes and houses with fireplaces. Plus, my fair skin gets sunburned in the summer, and that just isn’t healthy. This winter, I spent nearly a month in Colorado, and I only saw a few flakes. That doesn’t mean I was climbing mountains looking for it, but I expect it to come to me every now and then. The one time it did snow, I was visiting another state and missed it. My bad luck is kind of impressive. The good news is that it wasn’t snowing in Budapest either. I didn’t miss some awesome, fun blizzard while sitting in a sunny region. My Hungarian friends also weren’t throwing snowballs. 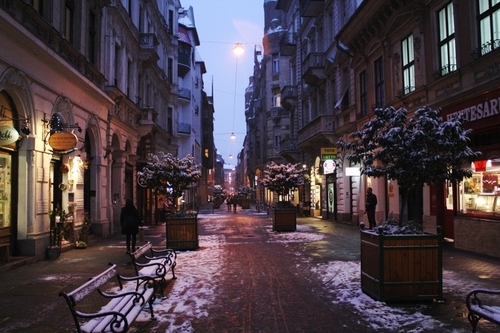 Then, when I returned to Hungary, the weather got really cold. It’s been fluctuating between freezing frreezing frrreezing and just really cold, but it still has been pretty intent on prohibiting snowflakes. It almost seemed like this winter was a lost cause. Finally, it happened! There was a nice (light) snowfall on the city. So, naturally I got so excited that I grabbed my camera and got ready to go out and take some pictures. I was really excited, and then I checked the temperature. I don’t remember what number it was, but it was much lower than I would like to see when my hands have to be exposed to operate a camera. So, naturally, I made a cup of tea and watched some TV. It was comfortable, so I repeated. Again and again. Until the sun was nearly setting. Uh oh. Did I waste the day? No. I threw on some warm clothes and dashed out into the night. The pictures weren’t great because of the lack of light. Even the snow seemed to be missing. That’s when I noticed an army of men with brooms doing their best to clear their sidewalks. I started snapping pictures furiously. The moral of the story is that you can’t pretend snow will just last. Even if the temperatures are enough to make a penguin put on a coat, some flock of city workers may be doing their best to exterminate the little bit of frozen stuff that makes you happy. Lately, the years seem to just be flying by. Every year I expect that I’ll do more traveling than the previous one, but that doesn’t always happen. But, I suppose a lot of people set yearly goals of reducing things (such as body weight), so I’m really pretty awesome that I can decrease something. In some ways, 2013 was a letdown of a travel year. When I look at the list of countries I visited, it’s unsettlingly small: Hungary, Turkey, Serbia, and Austria (I don’t find it necessary to throw the USA on that list). However, I broke that down to cities and events visited, and I feel a little better about myself (but, I’m too lazy to list all that here). Let’s just say I looked at other continents, saw furry monsters, had free tickets to see a famous rock band, drank coffee in palaces, walked by bombed buildings, saw a major river flood a city, saw protests from my window, watched a marathon finish line, and rode in a terrifying cable car up an Alpine peak. That’s not all, of course, but I’m tired of listing things. Budapest is becoming quite a touristy city. That isn’t surprising given how beautiful it is, but parts of it baffle me. They file off of their buses or river cruise ships like a pack of trained animals. Their cameras start rocketing off pictures, and they follow guides who speak to them in their language of choice. They head to (usually) beautiful restaurants where they eat a “traditional” Hungarian meal. Then, they head back to their hotel or ship, and prepare to see somewhere else the next day. It’s unlikely that they ever actually speak to a Hungarian person. Now, I do think this is a much better way to travel than staying home and watching TV, but it does leave out some important aspects. For example, it takes away the satisfactory feeling of discovering something on your own. Also, all of your experiences were designed by someone else, so you end up seeing a place in the way that they do. But, most of them are old, so more power to them! The flooding Danube River in Budapest, Hungary. My point is that I could easily travel by following one of those methods (or something similar). But, is that really getting the full experience? On the other hand, I spend most of my days hanging out with people from a multitude of different countries. In doing this, I’m accidentally having the cross-cultural experiences that other travelers tend to miss when they have their nose stuffed in a guide book. I’ve been taught many little tidbits of language that phrasebooks don’t include. I’ve had home-cooked, traditional foods from countries (and continents) I’ve never even been to (keep in mind, it’s not always good, but it’s diplomatic to say you enjoy it). I’ve become caught up in elections, natural disasters, and other national events that involve people I’ve never met (and I often have to ask people to translate news stories because they aren’t covered in international media). I could keep listing ways that I accidentally get involved in other cultures, but the point is to focus on the basis of culture. If a goal of travel is to see culture, it’s important to remember that this is a phenomenon that surrounds people much more than places. My advice is simple: Be a little racist. Go find someone who is from somewhere different than you and start being friends with them. There’s a good chance that you can have a much deeper “travel” experience than someone who rides a boat through six countries in a week. But, seriously, I also want to go more places this year. Where should I go? A cable car up the Untersberg near Salzburg, Austria. I talk to a lot of European people. That’s not really a shocking surprise given my lifestyle. After all, I live in Europe and it probably has the highest concentration of Europeans of anywhere on the planet. Sidney, Nebraska from the car. Now, let me get back to my point. The conversation often turns to discussing whether that person has visited my country. Once we pass that terrifying boundary, we can narrow that conversation. Most who have been want to talk about their trip(s), and most who haven’t want to talk about where they’d like to visit. I can only recall ever meeting one person who hadn’t been and said she didn’t want to go. She was a chain smoking Austrian who, after a significant amount of beer, said she had learned smoking indoors is banned in many American establishments and therefore has no desire to ever step foot in the country. Shortly after this exchange, Hungary banned smoking indoors and I never had to speak with her (or go home with smoky smelling clothes) again. Travel allows you to see terrible catastrophes. But, everyone else tends to have the same destinations that they went to, or want to go to. Topping the list are New York City and Los Angeles. These are followed by other hot spots such as Las Vegas, San Francisco, Miami, the Grand Canyon, and Route 66. You might wonder where I’m going with all of this… Well, so am I.
I’m trying to prove a point. After the major city conversation, I always tell people that the best way to see the US is to rent a car and drive around. I tell them that it doesn’t even really matter where you go, just get out of the big cities and see how the rest of the country lives. Throughout my life, I’ve driven around much of my country. In my mind, it’s the wide open spaces and spread out towns that make it up – not the large cities known throughout the world. I like (some of) those cities, but I don’t think they accurately show what the country is. But, it’s been a few years since I’ve gone on any big road trip. I always get lazy when I come home to visit, and I typically save my travel energy for when I’m in Europe. So, last week I went to Nebraska (it’s okay, I’ll pause so you can look it up on your map). The drive was only a few hours, but I was traveling with two crazy dogs, so it felt like a lot longer. I spent a few days in a small town with my parents (and, of course, the two crazy dogs), and it was pretty enjoyable. It’s the kind of town where everyone seems to know each other. Every time I was at a shop or a restaurant, customers and workers would be happily chatting away about personal matters – the kind of relationships that you don’t find as often in cities. The speed limits were slow on the roads, and the local police seemed to have little else to do than give speeding tickets, so the cars puttered along like snails. Random people would wave on less busy streets. Everyone smiled and no one seemed to be in a hurry. It was the Small Town American as seen in 1950’s television. I had a lot of really good food (maybe not the healthiest…), and enjoyed wandering around. Then, the weather changed and I didn’t have enough warm clothes with me. At that point, I had to stay inside. That’s where I started to miss the city life, because there weren’t enough cafes to just go hang out at. I started to get cabin fever, but I watched a lot of TV, got a lot of reading done, and had some pretty epic battles over the sofa with a dog (I usually won). A great travel companion (except when she barks in the middle of the night). Overall, the trip made me miss some of those long road trips I love so much. Whenever a European makes a comment about Americans only speaking English, I remind them that I can drive for days in any direction and never encounter another language (and then remind them that they started the conversation with: “You’re American? Great, I can practice my English!”). If you really want to see the United States, don’t limit yourself to New York. Yeah, it’s awesome and worth visiting, but it’s very different from the rest of the country. Most likely, you’re going to have some really enjoyable experiences once you let yourself enjoy the freedom of the wide open roads and endless towns. If you go to Nebraska in January, bring some good books. Such thinking requires a reward. I don’t know who first said this, but I would give that guy a high-five. On another cold, December night, I was walking to get some dinner as a break from studying. With St. Stephen's Basilica being on my way to the restaurant, I decided to cut through the square and see the Christmas market. Almost immediately, I realized my mistake. Anyway, as I looked at the mass of unmoving people blocking the route to my destination, my vision suddenly became a lot darker. I was pretty sure it was the beginning of my transition into a super villain, but I shortly became disappointed. 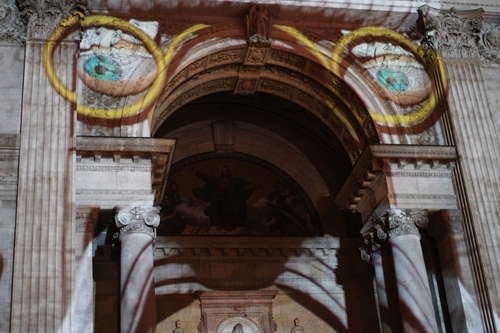 It was simply the lights on the front of the church going dark to start the laser show. I happened to have a perfect view since I hadn’t yet entered the fray, and all the other sloth people were trapped in their web of frozen movements, so no one was able to rush in and block my way. So, I spent at least half of the five minute show without any little kids bumping into me. The good news is I had my camera with me. The bad news is that I didn’t have a lens that was wide enough to take pictures of the whole building (in defense of my lens, the building is gigantic). So, I was able get some cool picture in bits and pieces, but not the whole scene. And if you think I would’ve moved backwards into the man eating crowd to get a picture of the whole basilica, then you’re a crazy person who has clearly never been to a Christmas market in Budapest. In that case, I recommend you go. They’re lovely. Oh yeah, about the show. It was weird. There were a lot of snow flakes and windows that moved around. 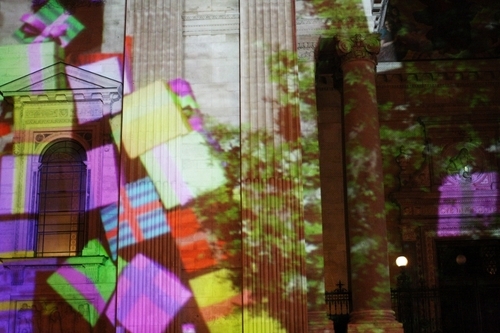 Then lines of light would trace all the lines of stone in cool patterns. Then a bunch of presents fell out of these imaginary windows. More snow. A giant Christmas tree grew in front of the place. Snow. The front of the building turned into Santa with a crazy mustache. Then clouds and bursts of light exploded from the mosaic of Jesus in the center. Then all the Italian people went back to their shopping (and standing). If you know me, you know that I can barely speak Hungarian. I understand a lot, but I mostly only know words (not sentences), so I sound like a child when I speak. A stupid child - not a cute and funny one. Christmas lights? I better get out my camera! Anyway, it was freezing the other night, and I was going to get on the metro at the stop in front of the Opera. There was a Christmas tree and a nutcracker statue out front, and my camera was in a bag under my arm. So, I pulled it out and fired off some shots. This was all easier because of my fingerless gloves that I was wearing. As I popped down the stairs, I pulled out my metro pass and said “hello” to the ticket inspector in Hungarian. He had simultaneously greeted me in English, and then he laughed heartily. His explanation followed, and it was something about thinking I was a tourist because of my camera around my neck. I smiled and walked away. But, the ancient metro station of the Metro 1 doesn’t allow you to walk far. And, having just missed a train, I had to stand and wait. He saw it as an opportunity, and my headphones didn’t discourage conversation. He noticed my half-gloves, and pointed at them and told me (in Hungarian) that it was too cold to wear them. I kind of chuckled and put on a face that I hoped looked manly, but it might just have come off as mentally unbalanced. Then, I thought our conversation was over. Now, you should know that most metro ticket checkers seem to be incapable of anything more than grunting. They pay so little attention to your tickets that I’ve considered showing them something else to see if they noticed (like a driver’s license, or maybe a dog…). But, this inspector walked a little closer and kept the conversation going (requiring me to now remove my headphones). But, I didn’t understand his next sentence, so I was forced to bring out my most useful phrase that explains I don’t speak much Hungarian. Then, Inspector #2 decided to also break the important “Grunt Only” rule of the Budapest Transit Company. He asked, in English now, where I’m from. I told him, and we all smiled and nodded for a second. Back to Hungarian! This translation is probably slightly off, but Inspector #1 said something like, “Seriously, why don’t you have fingers on your gloves? You’re carrying a nice camera, so you obviously have enough money to buy the other 20% of the fabric necessary to prevent freezing.” But, he said it with genuine concern – not as an attempt to make fun of me. I tried to explain that I can’t operate the camera with my fingers covered, so this does just fine (what’s wrong with the pockets in my jacket, anyway?). At this point, I switched into my typical Hunglish speaking where any word I don’t know in Hungarian simply comes out in English. I’d like someone to film me doing this, because it happens subconsciously and I bet it’s pretty entertaining. With market stalls selling things like this, how can I resist taking pictures? I said the Opera is beautiful, and Inspector #1 got excited because he thought I was going to see a performance. I tried to tell him I was just taking pictures, and seemed equally excited to find out I had just been inside the building with my camera. I hadn’t, and I’m pretty sure it’s forbidden to take photos inside, so it seems he hasn’t either (not surprising – he didn’t really look like the opera type). Then, there was a pause in the conversation, and Inspector #2 asked (in Hungarian this time) if I was American. I thought we’d already established that, but “yes” is an easy word, so I took that route. Seriously, how long do these trains take? For what I have decided is the last time in my life, I told someone I’m not from New York. It’s worse than telling a kid the Easter Bunny isn’t real. Then Inspector #1 came back, said some other incomprehensible Hungarian words, and I smiled and nodded. They smiled and nodded. We all smiled and nodded together. Finally, the train came. We said goodbye and I left. You’ll never be able to guess the pronunciation or meaning of this word… But, doesn’t that little accent on the O make commuting seem more fun and exotic? He bore a strange resemblance to the director of my MBA program, but I was too distracted by his big red bag full of szaloncukor that he distributed to everyone who was on time (a challenge for a class that isn’t usually held first thing every morning). I assume it’s just coincidence that bribery was one of the topics of today’s lesson. These schoolchildren are dressed for the occasion. It’s pronounced “ME-cool-osh,” and it is the Hungarian name for Santa Claus (coming from the name Nicholas). On a sweltering morning in the heat of August in Budapest, I was sitting in my apartment wondering how to last another day without melting. Suddenly, my phone broke the silence with its piercing ring, and I picked it up. For a little back story, you should know that Gödöllő is a town near Budapest that I’ve been meaning to visit for a very long time. 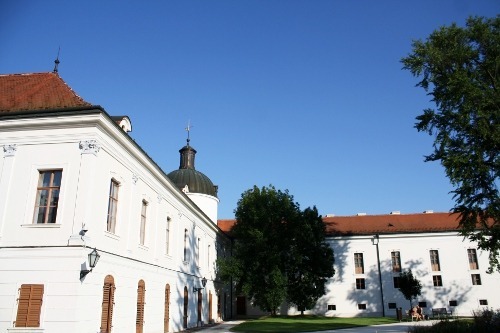 It’s easy to get to, and has a famous old palace there (and I love palaces). I’d been thinking about going for the past few weekends, but the heat always killed my motivation to get up and go. But, on this particular day I decided I might as well just sweat somewhere else, so I got dressed and headed out. I took the metro to the HÉV (Budapest suburban railway) where I bought a sandwich and met my friends. After about an hour long train ride through some nice cool forest, we arrived. Most of the day was spent at the palace, which was nice. The downside was that we had to constantly dodge the multiple weddings taking place there. The upside was that we got to constantly watch wedding guests. The highlight was watching one of the brides throwing her bouquet. The other girls all grouped behind her, and she threw the flowers right over her head and they landed about one inch behind her. In other words, the bouquet made it less than 1% of the distance that it needed to go. Everyone laughed, and they tried again. 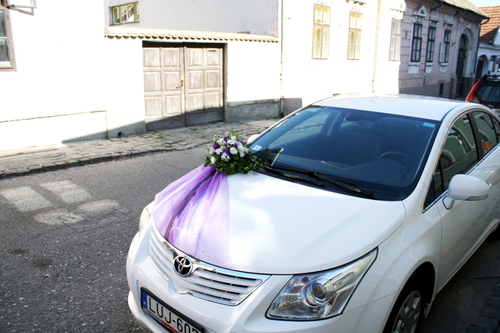 On the second attempt, the bride managed to get the bouquet to her friends. They all pushed to try and catch it, but at the last second, they all scattered as if it was a biological weapon. Then, they picked it up off the ground and forced it upon who girl who it seemed to have touched before its crash landing. Enjoy my pictures. I didn’t take any of the inside of the palace because you had to pay extra to bring your camera in, and that was outside my student budget. This word looks pretty easy, because most of the Hungarian months are similar to the names in English. Make the „u” into an „oo” sound, and the „s” into a „shh” sound, and you’re good to go. I still exist. I’m still in Budapest… sweating. I’ve been busy. I know I always say that, but let me fill you in, my dear readers. 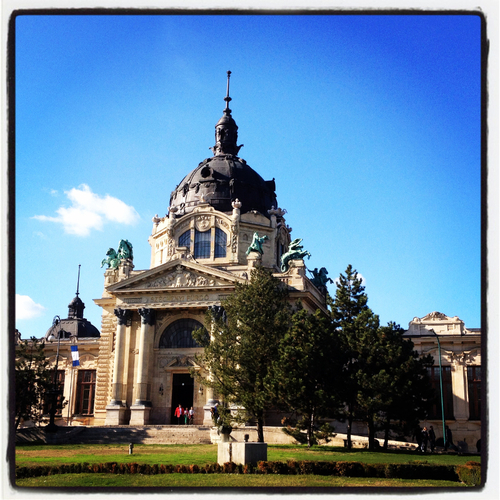 First, I finished up the first year of my MBA at the Corvinus University of Budapest. I’ve had a lot of fun, and learned way too much, and I’m looking forward to the next (and final) year. And, my grades were pretty awesome, thanks for asking. The first Think and Drink logo. Third, I’ve started working for the website ExpatsHungary. It’s pretty much exactly the kind of thing I like doing, so it seems to be a great place for me. I’m learning a lot, and it’s really cool to see how something like this works from the inside (instead of just reading it, like I usually do). Plus, there’s a puppy in the office (need I say more?). Fourth, I’m actually starting to work at studying Hungarian… a little. Three years in a country seems like a worthwhile time to do that, right? I’ve found some good resources to get me started, and the annoying help of the website HabitForge has been keeping me honest about it. Who am I kidding, Hungarians have started acting like they’re going to hurt me if I don’t start speaking to them in their language. Don’t let history fool you, they can be vicious. So, I’ll try to start writing more, but at least expect more pictures. My camera and I have become pretty good friends lately. This word is kind of rhymes with car, but starts with a fairly self-explanatory NY sound (basically, say each letter normally – but at the same time). Oh yeah, it means „summer,” you know, the hot miserable time of the year. 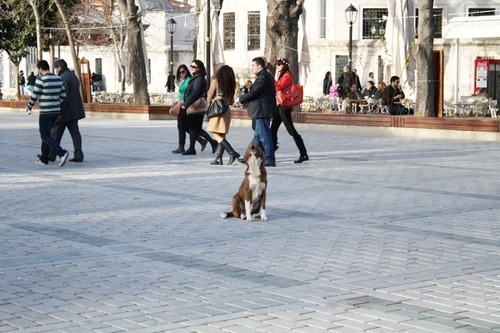 A wild dog in the middle of a city? 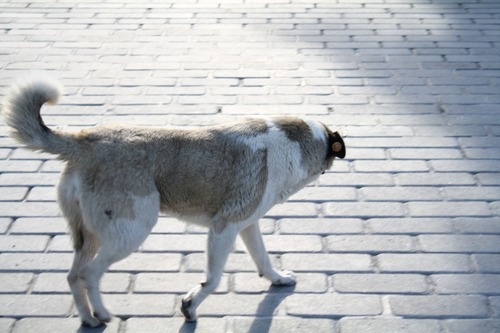 (Click image to see larger)In my travels, I’ve seen plenty of wild dogs. I really notice them because I love dogs, and I always try to decide if they’re happy and healthy or not. I sometimes watch domesticated dogs in a house and wonder if they would be more pleased with life while wandering the hills with their pack. The one who's missing his tail. (Click image to see larger)Anyway, one thing I’ve never seen is a pack of wild dogs in the middle of a city with a population more than 13 million. Well, I hadn’t seen that until I went to Istanbul. I found them there. 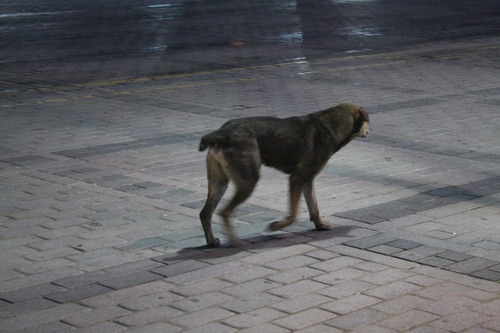 Our first night in Turkey, just a few hours after getting off the plane, we were wandering through one of the biggest tourist areas in the city and noticed a dog running along. Where was its owner? 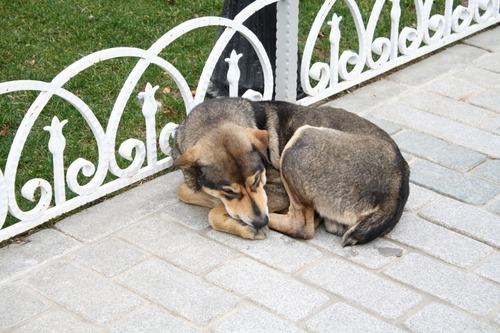 As I struggled to find a person who belonged with it, I noticed a few other dogs. Finally, I realized it was a pack of six or seven of them running along. I recognize you! (Click image to see larger)After that, we managed to run into them all over the place. Sometimes they’d be in a big group, and other times it would just be one or two of them following a food cart or taking a nap. I even started to get used to them – something I never expected to happen. Just hanging out. (Click image to see larger)There was also “the one with only half a tail,” “the one who really likes food carts,” and “the playful one.” I know there were others, but I didn’t find it important to write down at the time. That’s a regret. The best, however, was “the one who sings the call to prayer.” Multiple times a day, the speakers outside of the mosques would belt out the sounds of a man singing the call to prayer. It would echo across the city and was especially loud if your hotel was right next to one (like us). 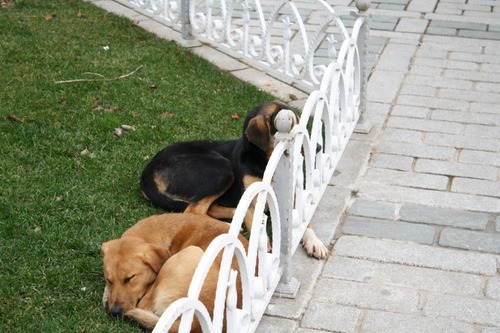 Overall, these dogs look like they have a decent life. They look fairly healthy, and I noticed tracking tags on some of their ears, so I think someone is watching out for them. They can go to sing-a-longs, eat leftovers, roam around with their friends, and take naps in the shadows of famous places. Not bad really, kind of like a permanent vacation. The view from the roof (breakfast room) of our hotel was worth it. (Click image to see lareger size)My father and I went to Istanbul, and we learned some valuable lessons. One was very noteworthy because it led to one of my most serious near death encounters. It turns out that when Turkish people fly planes they… well… hold on. Let me give you some background information first. Keep in mind that all this is based off of the inhabitants of Istanbul. It (probably) doesn’t represent all Turkish people. 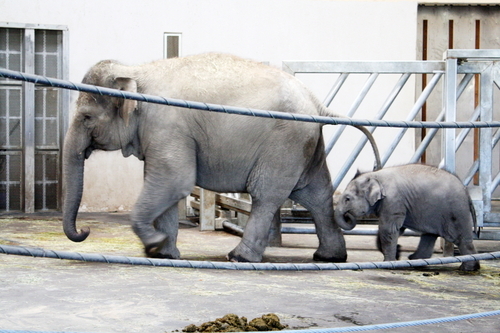 But, when they walk, they tend to walk directly towards where they want to go. It doesn’t matter if there are people, animal, cars, or anything else in their way. If they believe that it physically can move, they expect it to. Also, they ride motorcycles the same way they walk. They climb on and load it with any cargo they need. Then, they fire it up and aim in their desired direction. Buses, trams, and even trees seem to be expected to move. I loved these colorful lamps in all the bazaars. (Click image to see larger size)Cars really only have one difference: a horn. They drive where they want, when they want. If anything blocks them, they can always honk for a while. They seem to know they’ve now come to a higher point in the food chain with this vehicle, and they love it. Buses are just giant tools of destruction. We rode on a sightseeing bus that stopped periodically throughout the city, and one of these points was in the middle of a big pedestrian square. By definition, no moving vehicles should be allowed here, so walkers let down their guard. We sat in the front seat on the top level of a double-decker bus and watched an old man with a cane almost go underneath our tires. He wasn’t saved because the bus stopped for him – the old man just realized it was there two seconds before his life was over. Boat captains employ the same strategy as everyone else. There are a ton of ferry boats, and my dad and I watched them in their chaos from a bridge our first night there. They would just pull away from the dock and gun it in the correct direction. It was like they were aiming for each other. “They would lose their license in New York for doing that,” he said to me. It was difficult to tell where the water ended and the land began. (Click image to see larger)Finally, back to the airplane incident. If you haven’t figured it out, they seem to fly the same way they do everything else. We had a nice approach flying low over the city, and I was loving looking out the window and getting a visual map of the city I was about to explore. Suddenly, the plane started floundering side to side. I would have a good view of the ground, and then a great one of the sky. Then it started doing it from front to back – the nose was pointing up, and then the tail. Finally, the pilot pointed the nose towards the sky and the engines roared to full power. The plane shot up into the sky like a fighter jet (I didn’t even know that was possible for passenger planes), and it was only seconds before we were out over the sea since the airport was near the coast. The engines were still roaring, the plane was still flopping in all directions, and we were bumping through the air as if we were about to fall at any second. We safely managed to land (after another great view of the city), but I spent the whole time wondering who it was that mixed up 23 and 32 – our pilot, another pilot, or the air traffic controller. But, after spending some time in the city, I realized it’s just what they do. Probably both pilots saw the runway they wanted and decided to just go for it. Other than that, the food was tasty on the fight. This word means „Turkey” (the country), and it’s kind of pronounced „Ter - ook (rhymes with hook) – or – sag.” The two Os at the beginning with the dots over them are pronounced the same, so just do your best. But, it’s probably safer to go somewhere else, so you can always just learn the name of another country. If there’s one thing I’ve learned this winter, it’s that airplane tickets work in mysterious ways. A bridge that links Europe with Asia. If that doesn't inspire you to travel, nothing will... (click image to see larger)I’ve wanted to visit Istanbul ever since I moved to Hungary, but I’ve never had the chance. The plane ticket prices never seemed to change much, and they were always just out of my price range. Taking a train would be ideal, but it was just too long for the breaks that I had. So, I would unsuccessfully try to go there on every vacation I had. Finally, I found a way. My dad was able to come visit, and we were determined to get there. We knew it could work if we put our heads together and figured something out. I love trains. Unfortunately, this is about as close as I got to a Turkish rail adventure. (click image to see larger)Round trip train journey. It would take nearly two days when going direct, and the routes were difficult to find out about. Plus, some helpful internet article said the tracks are being rebuilt between Turkey and Bulgaria, so there would probably be some mysterious buses thrown in. Verdict: Too long and not enough information. No. Round trip flight. This wouldn’t include any train trips, but would allow for another small train trip somewhere else. The only problem was that it was pretty expensive. Enough that it didn’t seem worth it. Verdict: Too much money, not enough adventure. No. Boats may be the best way to travel. Where else can you hang off the back while looking at a flag (not on an airplane). (click image to see larger)One way flight, train the other direction. This seemed logical. We wanted to ride trains, but they were too long, and we didn’t want to fly (plus, it was too expensive). The strange part here is that a one way flight was more expensive than a round trip. Significantly. Verdict: Higher price for less flight time isn’t worth it. No. Half a round trip ticket, train the other direction. It seems logical that you can buy a round trip ticket and just use half. After all, what if you just miss a flight? Or love a place and never go home? Or get sent to prison? There are loads of reasons people don’t use the second half. But, it seems that an airline can technically add on a charge for that (if they so desire), and it’s not difficult to do in the age of credit cards. If you’re a lawyer, please get back to me on this issue. Verdict: Not worth it because no one likes extra charges. No. Swimming is a form of transport. And, the Istanbul authorities find it necessary to make sure that (Turkish speaking) people understand this fountain isn't a swimming pool. (click image to see larger)Fly to Istanbul, then fly somewhere else. A three way trip that starts in Budapest, goes to Istanbul, and eventually ends in Belgrade is cheapest (less than either a one way or a round trip). It doesn’t make any logical sense, but it is a fact. Strange. Verdict: That’s too weird to pass up. Yes. So that’s what we did. We flew from Budapest to Istanbul, and then we relaxed a few days. 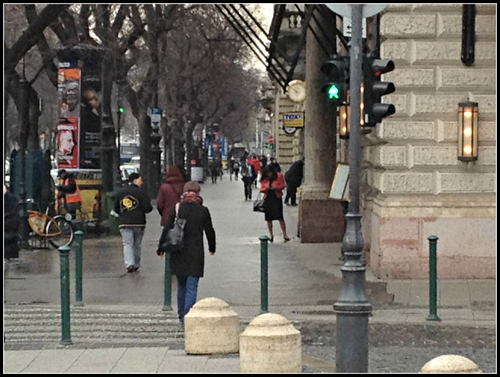 When it was time to move on (and believe me, it was time), we hopped on a flight to Belgrade, Serbia. It was unexpected, but my ticket stub from Istanbul to Belgrade has become one of my prized possessions. That’s a flight that I never, ever thought I would take. So goes the world of flying. This is one of the reasons I like trains. It’s pronounced „Reh-pool-uuh-yah-dj,” and it means „airplane ticket.” However, it’s a direct translation, so I’m not sure if it’s what people actually say. If it isn’t, it will make for a good laugh for Hungarians. Sounds delicious, but what could it be? 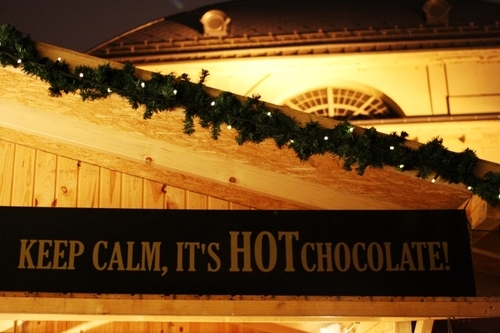 (Click image to see larger)One of the best things about Europe is the Christmas markets. 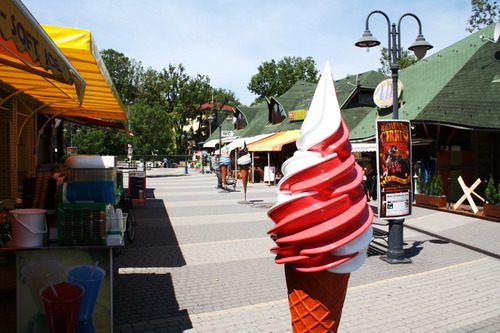 They are beautiful, and they have lots of stands selling delicious foods and cool gifts. You can wander around for hours just taking in the season. Oh, but it’s freezing, so it’s kind of miserable. Really miserable, actually. For this reason, they drink hot mulled wine (or “forralt bor” in Hungarian). IMPORTANT: Before you run off to the microwave and toss a bottle in it, read the rest of this. It isn’t simply wine that’s served at a warmer temperature, it also has a bunch of spices added into it. There aren’t many better ways to beat the cold. You have a hot cup warming your hands while you walk, and every now and then you take a sip of hot liquid that warms through your body. The spices have a sharpness to them that makes you really feel the flavor. If you make it at home, it goes something like this. (Click image to see larger)Now, the markets (and many pubs) sell it by the mug. They either ladle it out of a big cauldron, or they have some sort of carafe with a valve that helps it keep it’s temperature. These fancy mechanisms intimidated me to the point that I never tried making it at home. But, this Christmas I decided I wanted to take this little part of Europe home with me. A quick internet search helped me find a Budapest travel site that gave a recipe (see it here). Basically, it contains wine (obviously), cinnamon, cloves, ginger, orange peels, and brandy (unless you’re a little kid, in which case, just drink hot chocolate). This recipe was too heavy on one of the spices (the ginger, I think, but I can’t remember), but it was still delicious. If you’ve never had this, I highly recommend boiling some up at home (if I can do it, you can do it). Or, if you’re too lazy to gather the ingredients, just head to a European market or pub in the winter. Start in Budapest, because I’m biased. It’s pronounced “four-ahh-lt bore,” and it is the name of this delicious drink I’ve been talking about. I just wanted you to know the correct way to pronounce it. NOTE: I wrote this in December before I went home for Christmas. But, I forgot to post it. Better late than never, right? The Christmas market in front of St. Stephen's Basilica in Budapest. (Click image to see larger)I’ve figured out how to get a giant, beautiful Christmas tree for free, and you don’t have to do anything. Does that sound too good to be true? It’s not. I’ll tell you how, but first, let me explain my traditional method of getting a tree. Growing up in Colorado, there wasn’t a lack of nature. If we were bored in the afternoon, we could, at a moment’s notice, head off for a hike in some of the most beautiful mountains on the planet. Therefore, it’s not surprising that we went to these same mountains for a Christmas tree. One of the first weekends of December, we would throw a saw, some ropes, blankets, shovels, sleds, and other masculine items in the car, and take off for the forest. We weren’t the only people with this idea, so it would be rather crowded. Plus, the Forest Service would sell permits and regulate where you could cut trees, so really we were helping the natural environment (I guess I should add environmentalist to my resume). The downside is that mountains are at a high elevation and difficult to get around in. The “perfect” tree was never on the side of the road. Instead, it was at the bottom of a valley or the top of a cliff. Cutting it down was the easy part; getting it to the car was the hard part. Sometimes we would get it part way and realize we weren’t so attached to the bottom few feet (and shortly after, the tree was no longer attached to that part either). When real trees aren't good enough, get something artsy like this. (Click image to see larger)We would tie the tree to the roof, and start the drive home. 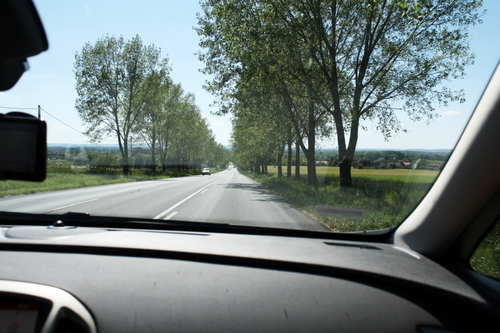 The narrow, winding mountain passes would require us to stop and readjust the tree before we got home (they never look as good after tumbling off the roof onto a highway – and the damage tends to be more severe than “just put that part in the corner”). Then, we would get home and realize that although the living room ceiling spans two floors of the house, it’s still slightly smaller than the sky in the great outdoors. Off goes another few feet. Thousands of pine needles fall on the floor, the dogs eagerly inspect the tree (the boys plot how to mark their territory without getting yelled at), and we bandage our cuts and drink something warm to help heat return to our bodies. That was what a Christmas tree meant. After I moved away from home, I noticed my parents weren’t so attached to this tradition. They put a little less effort into the process, and they bought one at a Christmas tree lot down the street. The price was much more, but the difficulty was much less. Last night, I was talking to them on Skype, and they pointed the computer at the tree so I could watch them decorate it. That was convenient because I didn’t have to make excuses of why I don’t actually like hanging ornaments (it hurts, those needles are sharp). The Opera Christmas Tree (in other words, my own personal tree that other people keep looking at). (Click image to see larger. )But, I have learned a valuable lesson about life. I’ve figured out a way to get a giant, beautiful Christmas tree that you can view from your warm home. You even get to sip your warm beverage while someone else sets it up for you. You don’t have to water it, or clean up needles. Move across the street from a famous landmark. The Opera House in Budapest gets a tree all to itself. It’s tall, beautiful, and decorated. All I have to do is glance out my window, and there it sits. No assembly required. Other people constantly take pictures of MY Christmas tree. Oh well, I suppose I can share. They set it up in the middle of the night, and they make an incredible amount of noise doing it. But, that’s still less exhausting than having to carry it down a mountain. In other words, Merry Christmas. I know it’s a little late, but give me a break, I had exams and trans-Atlantic travel to deal with. This is pronounced „Kaw-rach-oh-nyu-faw,” and it means Christmas Tree (probably).